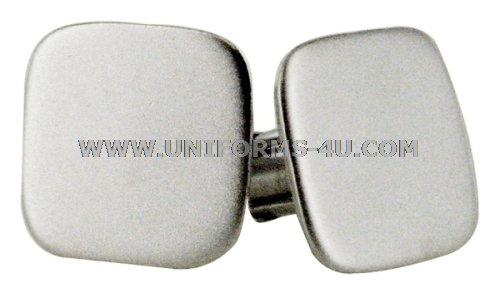 These satin-finished silver cuff links are authorized for wear with the Coast Guard Auxiliary’s Dinner Dress Blue Jacket uniform and are intended for wear with complementary satin-finished shirt studs (studs and cuff links should always have matching finishes). Note that both the cuff links and shirt studs require the optional pleated soft front dress shirt (i.e., tuxedo shirt) with a turndown collar. If you’re purchasing these cuff links, you might want to add the satin-finish silver shirt studs and the tuxedo shirt to your shopping cart.